"Dr. A" was a real-life figure, having devoted 33 years of his life as a very successful office reader and clairvoyant. 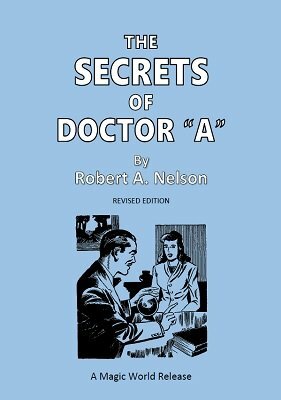 He gave Robert Nelson full permission to publish his unique secrets, however he requested that he remain anonymous. He devised, created and used what Nelson regarded as one of the finest - if not the finest - methods of giving private readings and (apparently) reading the minds of others. The system described is so subtle and versatile that Dr. "A" and Nelson both were able to give thought-staggering readings and demonstrations under the most adverse of conditions, whether it be in a private office, at a dining room table, a bar stool, or even (in the Doctor's case) while inebriated, standing under a street light. There is boldness in his methods, yet the climax packs such a punch that the client is left literally speechless. For answering individual questions - giving private readings - or to publicize your ability as a mindreader anywhere - this is it. This is the answer for the night club or hotel table worker, too. For private office work, Nelson believed this method invaluable to any reader. Nelson also includes superb patter lines, a psychological approach, and little extras and bits of business that he guarded for many years. The mental profession has long had a need for a sound, tried and proven method of giving readings - without any special apparatus - under practically any circumstance - and without guesswork. Direct thoughts are learned and revealed with amazing accuracy - and to the complete bewilderment of the spectators. Are you a Nelson collector? This book was listed as No. 166 in the Nelson Enterprises catalog . 1st edition 1946, 37 pages.